Oh yes. 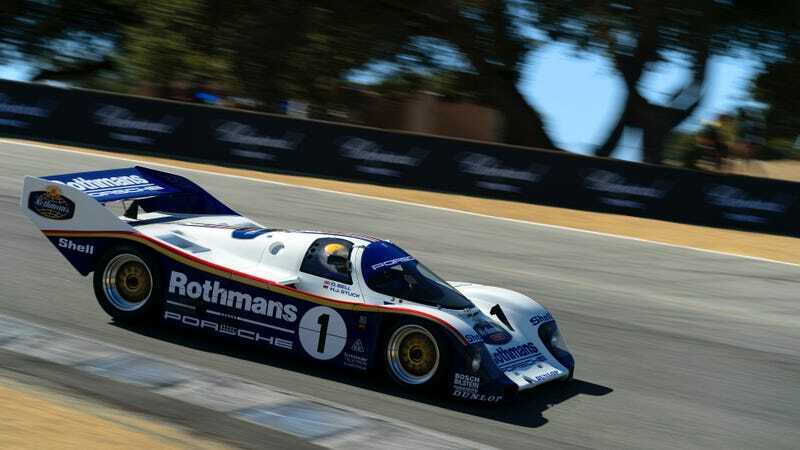 The onerous “Laguna Seca” mufflers come off this weekend because it is a violation of an unspoken, unwritten, yet universally accepted law that the Porsche 956 must be experienced at full volume. I come before you, oh readers, as I stare down a pile of laundry that includes way too many Porsche shirts and a large bag to pack. I am off to Rennsport Reunion VI, Porsche’s gathering of its most significant race cars and other vehicles. There is even a tractor race. I leave tomorrow. I will not sleep tonight. Rennsport Reunion started in 2001 as a sort of homecoming celebration for Porsche’s vehicles, and has since grown into the world’s largest Porsche gathering. Everything from historic 959 rally cars and 917 Le Mans cars to grassroots-level Porsche Club of America racers descends upon Laguna Seca. Oh yes: there will be 944s. Sixty thousand fans descended upon the last Rennsport Reunion in 2015, according to Porsche. This one is expected to be even bigger, given that Porsche has celebrated its 70th anniversary as a company all year long by breaking track records with their 919 Hybrid Evo. I’m willing to bet one half-eaten bag of lemon Haribos that the 919 Hybrid Evo is going to attempt a track record at Laguna Seca, if it hasn’t already. I’m just saying. The 919 showed up at Rennsport Reunion V, so it only makes sense that it’d come back this year. Even if a car so fast that it’s hard to process with your brain as it whizzes by doesn’t go for a record, there will be so many incredible cars there that it won’t even matter. Porsche expects 500 of its most fascinating cars to show up, 350 of which will be racing on track. Approximately 50 legendary drivers are set to speak to the Porsche faithful because, well, all those cars won’t drive themselves. A 1,600-car Porsche Club of America member lot will also be on site, in case there weren’t already enough Porsches on site. Porsche is even bringing its very first 356 sports car from 1948. Porsche 356 No. 1, on tour in Toronto earlier this month. It is the ultimate event for a Porsche dork, and I, a person who “decorated” the living room by hanging a spare 944 door on the wall and all but took a vow of poverty to race the Porsche that came with it, am the ultimate Porsche dork. The only way that this event could pander harder to all of my specific interests would be if it added a burnout competition. What would you like to see from this weekend?